Found growing in fields and waste grounds. The petals are a rich scarlet colour with a black centre. This herb does not have the potentcy of tis relative the Opium Poppy. It has traditionally been used for treating mild pain such as earache, toothache and neuralgia. Also taken to treat coughs, insomnia and acid digestion. 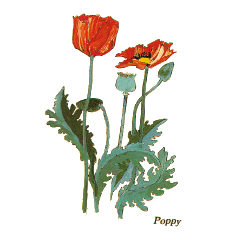 The poppy was the symbol of love in ancient Persia. 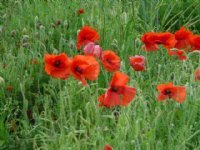 With countless blooming poppies in the grounds of the first world war battlefields, the flower has now come to symbolise the remembrance of war.